Have you ever wondered about the brilliant red colour, Carmine? And its application in many of the foods we eat? Well, this brilliant red colour gets its name from insects called ‘Cochineal’. These insects feed on cactus plants and their bodies turn red from the cactus pigment. These bugs are now collected from the plants and either left out in the open sun to die or are just crushed alive to extract the colour from their bodies. It is such colour extracts that are added to various processed foods like yogurts, fruit juices, milk shakes, candies and is frequently added in desserts for the deep red colour. Hundreds of thousands of bugs are killed daily for colouring processed foods and for use in the cosmetic industry. These cosmetics we happily smear all over our faces and mouths, but would we do so if we were aware of the cruelty behind it all? Do look for names like Carmine, Carminic acid, Cochineal, Cochineal extract, E120, Crimson Lake, Natural Red 4 – these are all the various names under which this colour is listed in processed foods and cosmetics. It is also worth noting that many food allergies are a direct result of such processed foods. Compassion for other forms of life can lead to better food habits and improve one’s own health. We need to be the voice of other living creatures, which are treated with so much cruelty. When we wish to liven up a pudding or other food with red, let us look at different methods of getting the colour. Here, I will share my recipe of mixed berry sauce that gives a dazzling red colour and tastes great with desserts too. Wash the berries and chop the strawberries removing the top part. Heat a pan and add both the berries. Add the sugar and the lime juice and cook this on low heat. Soon the berries will start to get watery and will become soft and mushy. You do not need to add water to this. Raspberries will soften very quickly. Continue to cook till the strawberries have softened too. Then turn off the flame and let it cool. Once cooled, you can blend this till you get a smooth purée and then pass it through a sieve to remove the seeds. You can cool this purée in the refrigerator or enjoy it warm with ice cream. I served this with dark chocolate cake and it tasted just delicious! It is quite easy really to use natural products for food colouring, like beetroot, berries and even pomegranates. A small step by each of us can help in minimising any negative impact on other living creatures and force changes in the food and cosmetic industry. A small life style change can lead to great happiness too. 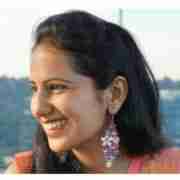 Ms Aditi Pathak Is based in Singapore. Widely travelled and from a Services background, cooking is one of her many passions. WILL WUHAN LEAD TO LASTING PEACE ON THE LAC?